From time to time, we feature some of the great products we have on our RedBubble Store. If you find a shirt or pillow or coffee mug, or some other product that you want to purchase, thanks in advance for your support! 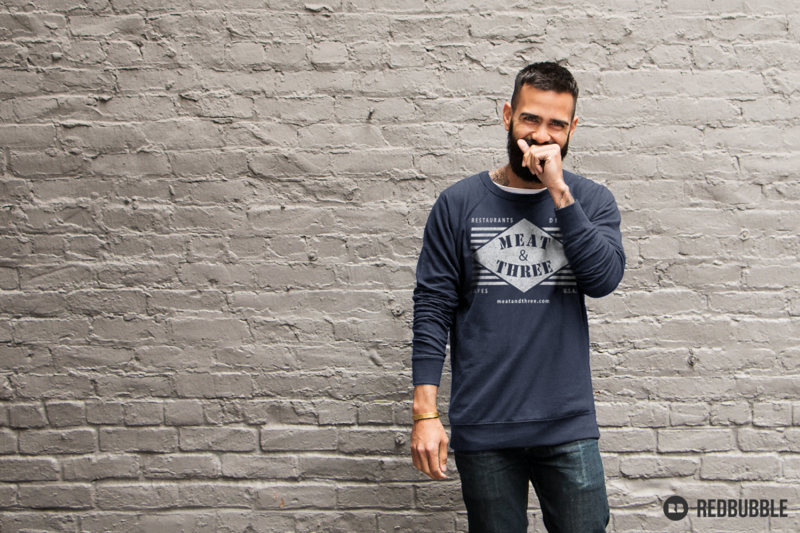 Here’s a Lightweight Sweatshirt with a sweet vintage Meat & Three logo design that’s perfect for fall weather … and beyond. We are of the opinion that this thing is pretty stinkin awesome and hope to see YOU in one very soon! Even this little Ginger Bread Man is into this Meat-and-Three Coffee Mug, and looking good in the process! It’s getting cold out there, and who can’t use another mug, right? Get one for you and a friend or co-worker. They make a really nice gift for your meat-and-three loving friends! Check out this Women’s Fitted V-Neck T-Shirt that proclaims the popular “I Love Meat-and-Threes” slogan that you just seem to hear everywhere you go these days. Am I right? If you also love “Meat-and-Threes”, you need to get to it and get one.